The CMCP850 Series Portable Field Balancing accessory kit contains all the accessories necessary to perform in place field balancing of rotating machinery. 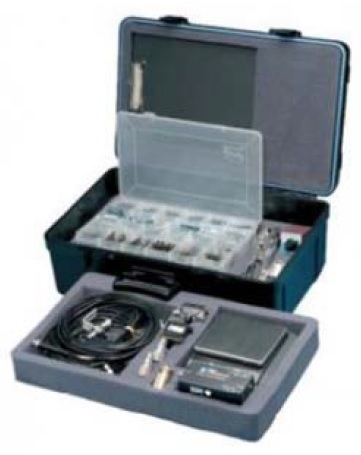 The CMCP850 Kit includes accelerometers, magnetic bases, cables, adapters, trial weight kit, a precision electronic balance scale, and more, all packaged in a rugged, watertight, hard case that makes balancing easier and more accurate. A variety of adapters are included so that you can connect your analyzer to other sensor sources such as on-line systems and velocity probes. The CMCP850 is a complete kit and is compatible with either the SKF Microlog Series or Emerson/CSI 2130/2140 analyzers. The Universal Connector Kit features cables with industry standard BNC connectors which can interface with any balancing system. In short, all you need to add is a portable analyzer and you are ready to balance pumps, fans, motors, couplings, small turbines and more. Field balancing kits are available with either a battery powered optical or laser phase kits or analyzer powered Optical/Laser kit which can connect directly to your analyzers phase input.